In April 2019, Pinchgut performed Bach's Easter Oratorio, a masterly celebration of Eastertide joy. Alongside Bach's jewel we present Telemann's Thunder Ode. Never before performed in Australia, this is one of Telemann's greatest masterpieces and a rousing work which calls forth the natural elements and celebrates the power of creation: a true showcase for the Orchestra of the Antipodes. An evening of sheer jubilation, uplifting elegance and grace. Johann Sebastian Bach, (born March 21, 1685, Eisenach, Thuringia, Ernestine Saxon Duchies [Germany]—died July 28, 1750, Leipzig), composer of the Baroque era, the most celebrated member of a large family of north German musicians. Although he was admired by his contemporaries primarily as an outstanding harpsichordist, organist, and expert on organ building, Bach is now generally regarded as one of the greatest composers of all time and is celebrated as the creator of the Brandenburg Concertos, The Well-Tempered Clavier, the Mass in B Minor, and numerous other masterpieces of church and instrumental music. Appearing at a propitious moment in the history of music, Bach was able to survey and bring together the principal styles, forms, and national traditions that had developed during preceding generations and, by virtue of his synthesis, enrich them all. 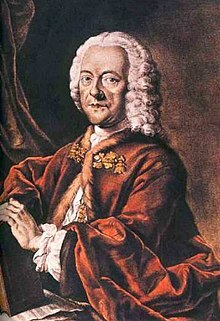 Born in Magdeburg in 1681, Georg Philipp Telemann belonged to a family that had long been connected with the Lutheran Church. His father was a clergyman, his mother the daughter of a clergyman, and his elder brother also took orders, a path that he too might have followed had it not been for his exceptional musical ability. As a child he showed considerable musical talent, mastering the violin, flute, zither and keyboard by the age of ten and composing an opera (Sigismundus, on a text by Postel) two years later to the consternation of his family (particularly his mother's side), who disapproved of music. However, such resistance served only to reinforce his determination to persevere in his studies through transcription and modeling his works on those of such composers as Agostino Steffani, Johann Rosenmüller, Corelli and Antonio Caldara. Bach himself thought very highly of his Easter Oratorio BWV 249 of 1725, even though it never attained the popularity of the Christmas Oratorio. Bach performed it four times during his lifetime with some parts of the work originating movements from the birthday cantata "Entfliehet, verschwindet, entweichet, ihr Sorgen" for Christian, Duke of Saxe-Weißenfels. Unlike Christmas Oratorio the Easter Oratorio has no narrator but has four characters assigned to the four voice parts: Simon Peter (tenor) and John the Apostle (bass), appearing in the first duet hurrying to the grave of Jesus and finding it empty, meeting there Mary Magdalene (mezzo) and "the other Mary", Mary Jacobe (soprano). The music is scored for three trumpets, timpani, two oboes, oboe d'amore, bassoon, two recorders, transverse flute, two violins, viola and continuo. Die Donnerode, or “The Thunder Ode”, was written in response to the catastrophic earthquake that destroyed Lisbon in 1755, in which about 60,000 people were killed. The work was premiered in Hamburg on a special day of penitence commemorating the event. Telemann uses no text that specifically mentions an earthquake, but there are lines about the voice of God rocking the oceans, with storms preceding him and His Voice making the proud mountains collapse. The setting is breathtaking, being the ultimate in word-painting. Regarded by his audience as avant-garde, the vocal parts and the scoring with three trumpets, the soloistic use of the timpani and instrumental ensemble made this work very popular and one of Telemann’s best known pieces during his lifetime.